Join this tour to see the most popular sites in the nation, including the famous Golden Circle, Jökulsárlón glacier lagoon and the stunning blue ice cave! On Day 1, you’ll be picked up at your accommodation in Reykjavik and spirited away down the south coast, The Golden Circle, which encompasses three of the most popular attractions in Iceland, is first. You’ll visit Geysir geothermal area, named for the sleeping giant Geysir, which has been entertaining onlookers for more than 1,000 years with jets of boiling hot water shooting high in the sky. Though Geysir sometimes goes inactive for years at a time, as he is now, Strokkur still likes to put on a dazzling display, blasting water as high as 40 m (131 ft). You can also explore hot spots of bubbling mud and sizzling steam vents as you wander the grounds. Finally, you’ll delve into the mysteries of Þingvellir, a UNESCO World Heritage Site. One thousand years ago, Viking lords stood in this valley to declare the law, make alliances and settle their nastiest feuds. You can also see the beauty of the natural environment here, from the gorge which marks the edges of the Mid-Atlantic Rift to fissures filled with sparkling water to Lake Þingvallavatn, the largest natural lake in Iceland. On Day 2, you’ll visit a total of five waterfalls nestled among the countryside, which includes stunning glaciers, rugged lava fields, looming volcanoes, rushing rivers and deafening waterfalls. In the end of the day we will go to the unique black beach Reynisfjara. On Day 3, highlight of the tour is a visit to a natural ice cave inside Vatnajökull glacier. The ice is spectacularly blue! Ice caves in Iceland are impossible to predict – each one is unique. Caves are searched out and discovered each year by glacial experts who select the most beautiful and safest locations, allowing you to have a truly one-of-a-kind experience in the heart of the ice. 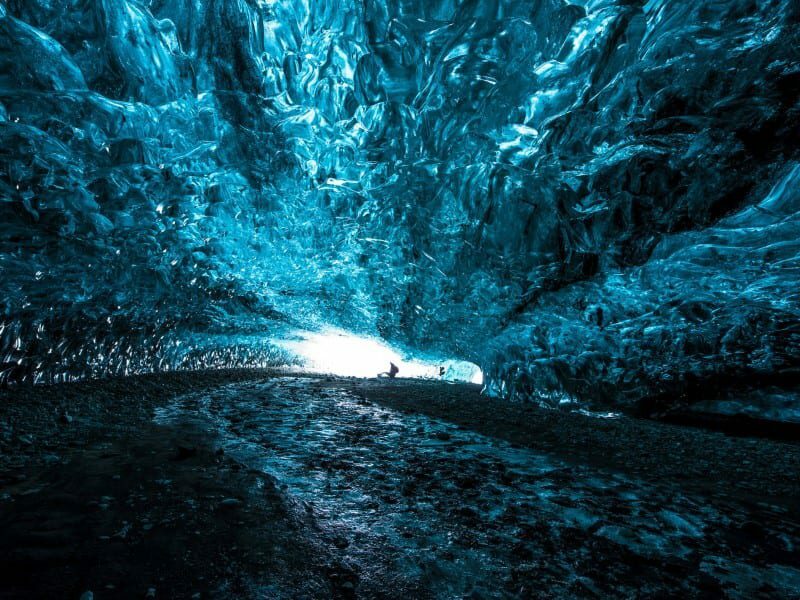 Don’t miss your chance to see a rare glacier cave! Check the booking availability above by pressing "Choose a date." Note: You should bring light luggage for the overnight stay. If you have big suitcases, they can be stored in Reykjavik while you are on the tour. Only small carry on luggage such as backpacks are possible. IMPORTANT: It can happen that the whale watching tour is cancelled because of weather and/or safety reasons. Then we will find other activities when possible or make a partial refund.